ARCHITECT‘S SPECIFICATION The compact monitor receiver with adaptive diversity technology shall be for use with a companion transmitter as part of a wireless RF monitoring system. The receiver shall operate within nine UHF frequency ranges, with a switching bandwidth of up to 42 MHz: 470 – 516 MHz, 516 – 558 MHz, 520 – 558 MHz, 626 – 668 MHz, 734 – 776 MHz, 780 – 822 MHz, 823 – 865 MHz, 566 – 608 MHz, 606 – 648 MHz; transmission frequencies shall be 1,680 per range and shall be tunable in 25 kHz steps. The receiver shall feature 20 fixed frequency banks with up to 16 compatible frequency presets and 6 user banks with up to 16 user programmable frequencies. 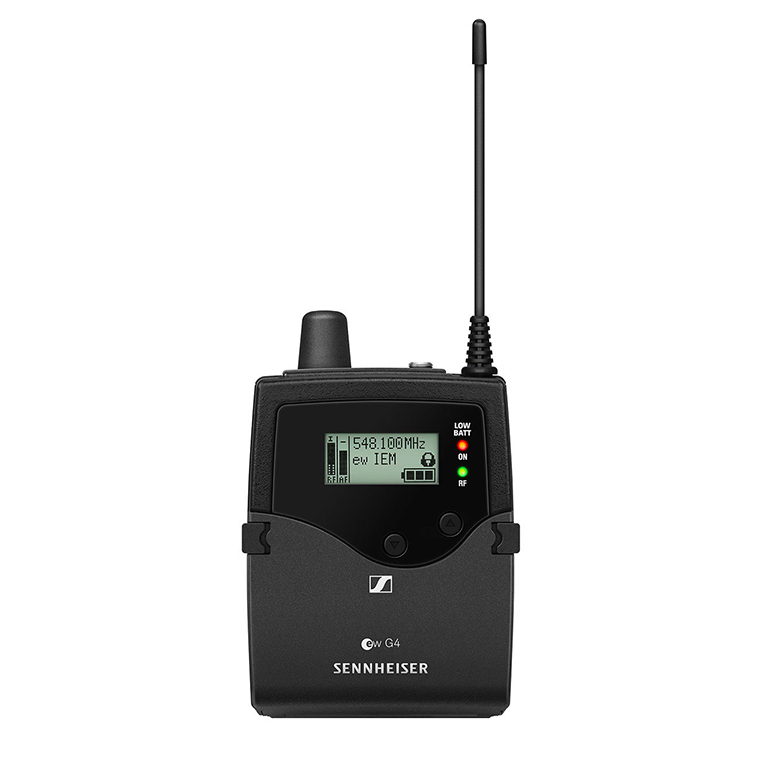 The receiver shall be menu-driven with a backlit LC display showing the current frequency, frequency bank and channel number, metering of RF level, metering of AF level, lock status, battery status, muting function or audio channels, and pilot tone evaluation. An auto-lock feature shall be provided to prevent settings from being accidentally altered. The receiver parameters shall either be configurable in the associated transmitter’s menu and synchronized with the receiver via an integrated infrared interface or shall be programmable in the receiver menu. The earphone output shall utilize a 3.5 mm stereo jack socket with an output level of 2.4 V with 5 % THD at nominal deviation and an output power of 2x 100 mW at 32 ?. Nominal/peak deviation shall be ±24 kHz/±48 kHz. Squelch threshold shall be defeatable (off) or adjustable from 5 - 25 dBμV in steps of 2 dB. The receiver shall incorporate the Sennheiser HDX compander system and a defeatable pilot tone squelch. Sensitivity shall be < 4 μV, 1.6 μV (typical) for 52 dBArms S/N with HDX engaged at peak deviation. Adjacent channel rejection shall be ≥ 65 dB (typical). Intermodulation attenuation shall be ≥ 70 dB (typical); blocking shall be ≥ 80 dB. Signal-to-noise ratio at 1 mV and peak deviation shall be approx. 90 dB. Total harmonic distortion (THD) shall be ≤ 0.9 %. The earphone output shall utilize a 3.5 mm stereo jack socket with an output level of 2.4 V with 5 % THD at nominal deviation and an output power of 2x 100 mW at 32 ?. The receiver shall include a switchable High Boost and a multi-level limiter. The High Boost shall be +8 dB at 80 kHz. The limiter shall be adjustable from –18 dB to –6 dB in 6 dB steps or defeatable (off). The receiver shall provide two audio output modes, stereo or Focus, and an adjustable balance. 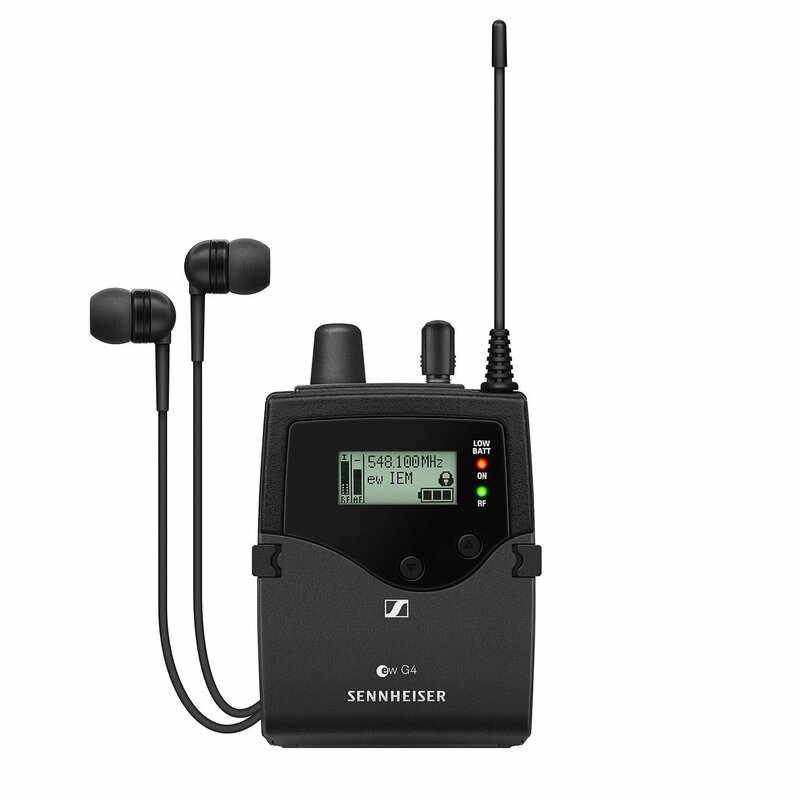 Power shall be supplied to the receiver by two 1.5V AA size batteries or by one Sennheiser BA 2015 rechargeable accupack. Nominal voltage shall be 2.4 V, current consumption shall be typical 140 mA at nominal voltage; ≤ 25 μA when receiver is switched off. Operating time shall be approximately 4 to 6 hours (depending on volume level). The receiver shall have a rugged metal housing; dimensions shall be approximately 82 x 64 x 24 mm (3.23" x 2.52" x 0.94"). Weight including the batteries shall be approximately 125 grams (0.28 lbs). Operating temperature shall range from −10 °C to +55 °C (+14 °F to +131 °F).